Stunningly Unique Custom-Built Villa! Lots of Privacy! 3 Min walk to beach! Alcazar De Playa, ' The Fortress,' is a custom-built home located in Playacar, a resort community adjacent to the Village of Playa del Carmen, Mexico. The Playacar development is 800 acres of elegant, all-inclusive hotels, condominiums, private residences, golf course, beaches, and Mayan Ruins. From Alcazar, it is a short 15 minute walk to the Village of Playa del Carmen. You will find five bedrooms, each with its own balcony, bath, and powder room. Each uniquely decorated. On the second-floor, the master bedroom has a spiral stair leading to a private rooftop patio with partial views of the ocean. Also on the second-floor is a common open air sitting/recreation area with a palapa roof and ceiling fan where everyone can gather. The entire house is air conditioned. Downstairs you will find the kitchen, dining room, and living room furnished with antique hacienda furniture as well as the foyer. The large courtyard patio, which can be accessed from either the foyer, the dining room or kitchen provides privacy amidst lush tropical landscaping. Meals can be taken in the dining room or on the patio as there are two outdoor tables with seating for 12 as well as a gas barbeque and marble serving station. From here one can enjoy the adjacent swimming pool or the tennis court within 20 yards of the house. It's only a three minute walk to the beach or a three wood shot to the golf course. 'Alcazar' is truly an elegant and spectacular villa with a combination of old world hacienda charm with modern touches. It is very suitable for large family gatherings including small children. For the very small we have a high chair and crib available. The pool is divided into a section for adults and a section for children and only steps from the patio. Our property manager speaks English and Spanish and can address all of your needs including transportation, meals, shopping, sports activities and tourist information. Our home provides several private outdoor areas for those times when privacy is desired. the unique design and layout provides access to all of the bedrooms without having to go through central areas. The patio/courtyard with its talavera fountain has complete privacy from neighboring villas. There are hamacks on the patio and crows nest as well as lounge chairs. The crows nest provides complete privacy for reading, sunning and lounging with a breeze and a birds eye view of the surrounding area.. the villa has several pieces of unique indiginous artwork and furnishings. All of the doors and windows are custom made from Honduran mahogany to give a unique look and ambience. 3 minute walk to the beach. private marble patio amidst lush tropical landscaping. One table with umbrella seats 4. One table seats 6. Marble Serving table near stairs to dining room. a Main Full Kitchen, Charcoal Grill (BBQ, Each Bedroom has private bath, balcony & powder room. Several common or private gathering areas. Chef available for Mexican and international meals as well as a masseuse. High chair and crib available. Alcazar is ideal for family vacations. We thoroughly enjoyed our stay at Casa Alcazar! We booked the home for a work-cation with a group of 6 women total. We felt very safe in the area in general and we were happy that the property manager Rasa and Carmen were available to provide additional support. When we arrived we were given the door code, but Carmen was also there to show us around, show us the path to the beach, and she explained everything. She was also nice enough to exchange pesos for a $20 bill since we wanted to take a taxi to 5th avenue and we had not exchanged any cash for pesos yet. She checked in on us each day via WhatsApp text just to make sure everything was ok.
Every morning, with the exception of Sunday, the groundskeeper, Polo was there to keep the property looking great. He also helped with drying the dishes that were washed from the night before and putting them away. He provided sheets and towels and offered to wash a set of clothing for us. He even made us a breakfast on the first day of sopes, quesadillas, eggs, and juice! It was a nice touch. The house is LITERALLY 3 minutes walk away from the beach and there is a clear area where you can set up beach chairs which are provided. All of the keys we needed to access the chairs, bikes, and other provided amenities were in the house in a box by the door. We decided to take some photos since we had a photographer with us and there are so many beautiful spots in the home to get great shots. From the gorgeous cream staircase at the back of the house, to the hacienda terrace on the second floor, and even the pool right behind the home. Because we were on a work-cation, I knew that we wanted to get some laptop time in and everyone would need the internet. The speeds are not as fast at home obviously, but they are also not painfully slow. There were 3 options for wi-fi networks, one that was fastest by the master bedroom, and 2 others that were relatively fast throughout the house. The photos gave an accurate description of the house with the exception of the top balcony. It is only accessible through the balcony doors from the master bedroom and they were bolted shut. We were told it was because the staircase to the rooftop was too narrow and potentially dangerous but I was hoping to see it based on the pictures. However, we had plenty of home to see while we were there so it wasn't that big of a deal. All in all we had a great time in this beautiful home. We enjoyed our vacation to Playa Del Carmen and our stay at this lovely house. Bernard, the owner was very attentive to our needs and quick to respond. Rasa and Polo were very welcoming and available when we needed help. The neighborhood was nice and felt safe. The pool (although a little cold) was nice for our kids and just a short walk away. The beach was beautiful but about a 5 min walk with our kids. The AC worked well in the house and we appreciated that there were fans in every room. The kitchen was great (although no dishwasher). There were a few cons that I'll mention: the living room was a little small for everyone to hang out in, but this wasn't a huge deal since were outside mostly. There were lots of mosquitos so bring bug spray! There were lots of small rodent-type animals that got into our trash one night, which was unfortunate. For small kids, the layout of the upstairs is not ideal. The landing of the upstairs level is open to the outside with all of the bedrooms off of that area. There is no fence around the house and lots of people walk by who could easily climb the staircase and go into a bedroom. I was worried about our small children being in a room away from me with this sort of setup. Also the rooms facing the front of the house were incredibly loud with street noise. The house is authentic and tastefully decorated but I wish I had known more about the upstairs setup before booking. All in all, it was a great vacation and everyone was very nice and helpful! We do indeed have local wildlife one of which is the harmless agouti which roam through the neighborhood. However we do not have any trash receptacles on the property that they can get into so I don’t know what trash is being referred to unless it was something left outside by a guest. The upstairs bedrooms do open onto an open air common sitting area adjacent to the staircase to the lower level which stair case has an iron grill work protecting it from outside intrusion from the ground floor. We have never had any intrusion situation during the 18 years we have been receiving guests as our gated community is secure and patrolled 24 hours a day. This house is amazing! It's like a little hotel within the house. Each room was huge and haf it's own private bathroom. The patios were excellent. Everything you need for short walk to the beach is at the house. No need to bring your own towels. Overall experience was amazing. Property manager and housekeeper very accessible and welcoming. Far exceeded expectations. Fabulous vacation rental in a very safe area. 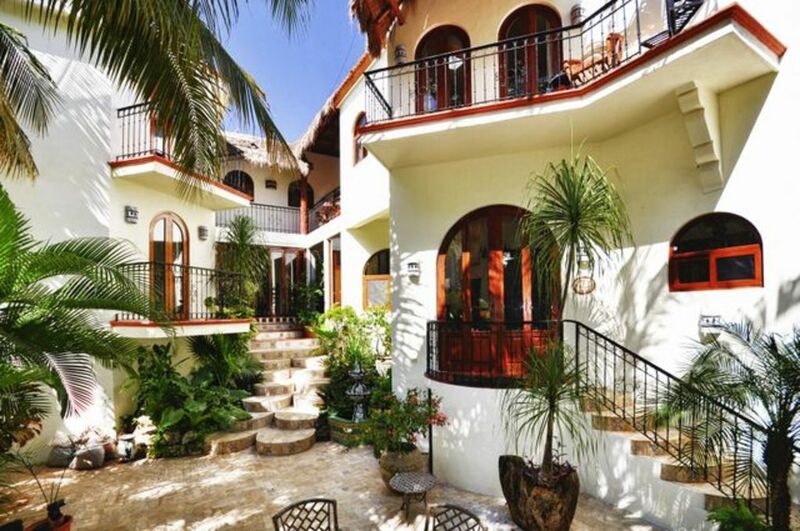 We took our family of 11 to Playa Del Carmen for the holidays and stayed in this great home. My expectations were far exceeded. The home is in a large guarded and gated community and close to everything you will want to do in the area. Raza, the house manager was spectacular. We hired a cook recommended by her for several of the days we were there and she was excellent. You are a 5 minute taxi ride or 15 minute walk to the main shopping and eating areas and a 3 minute walk to the beach with private access. All in all, we highly recommend this home. A place to forget all your troubles and relax and enjoy a peaceful existence... once you walk in the door, you’re surrounded with beauty and tranquility. It’s a haven for those who love a comfortable, worldly decorated atmosphere. The owners paid attention to the fine details of your stay. They provide a sanctuary of plenty of space and charm. A great home for family gatherings where one can still have privacy in their beautifully appointed decorated suites. It’s always heartwarming to know that a guest has really enjoyed our home. We are ready to welcome you back again. A wonderful home with excellent amenities. Close to playa. Beautiful patio and pool. Perfect for families and friends to be together. Playacar, Playa del Carmen, Quintana Roo, Yucatan, Mayan Riviera, Mexico (40 minutes from Cancun Airport) --- Alcazar De Playa, ' The Fortress,' is a custom-built home located in Playacar, a resort community adjacent to the Village of Playa del Carmen, Mexico. The Playacar development is 800 acres of elegant, all-inclusive hotels, condominiums, private residences, golf course, beaches, and Mayan Ruins. From Alcazar, it is a short 15 minute walk to the Village of Playa del Carmen.